The Economist magazine, owned and operated by the Rothschild clan, is known for putting out hidden messages in its cover art work and other media publications. Just in case you missed the past few years, here are the cover art for "THE WORLD IN XXXX" series, 2016 source link , 2015 source link, 2014 source link, 2013 source link. You may also want take a look at the AscensionWithEarth.com analysis of a dark and sinister media publication from The Economist Instagram feed, titled "The Economist Magazine Puts Another Cryptic Message "666 & Illuminati Owl". The Economist magazine once again has released another cryptic message on its cover using classic occult symbology by means of a tarot card deck. Tarot cards are used as a divination tool and are used gain insight into the past, present, and future. There are many types of tarot decks but common occult tarot decks consist of 78 cards divided into two parts, with 22 cards associated with the Major Arcana and remaining 56 cards relates to the Minor Arcana part of the deck. The Economist uses their own artistic interpretation of the Major Arcana cards. 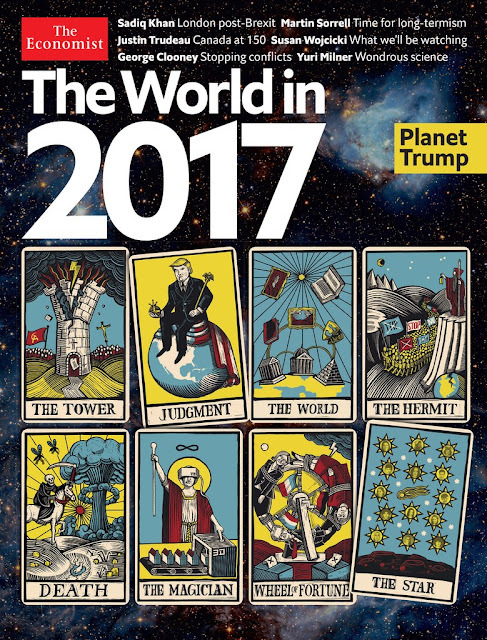 Looking at the front cover of 'THE WORLD IN 2017', you will notice that they have selected 8 cards from the Major Arcana tarot deck and laid them out on top of an image depicting the cosmic space of the Universe. Many say that Space exploration is the "Final Frontier" for human kind, but I suggest that the "Final Frontier" is actually understanding and knowing who you truly are. Knowing YOURSELF is the final frontier, but I digress. I am not a Tarot card expert in any sense and do not know if the position of the cards play a role in the interpretation and meanings of the cards. With that said they are positioned starting with THE TOWER card, JUDGEMENT card is next, followed by THE WORLD, THE HERMIT, DEATH, THE MAGICIAN, WHEEL OF FORTUNE, THE STAR. I have taken screen shots of each card from The Economist tarot deck and included interpretations from multiple sources including Benjamin Fulford, David Wilcock, Tarot expert James Rioux, and a website called BiddyTarot.com. I have also included a few personal observation notes for your consideration. AscensionWithEarth: The first card placed on this magazine cover should send the most vivid and powerful message. Seeing imagery of the Vatican Church crumbling to the ground does bring into question as to what is about to be disclosed to the public. One would think that the global Satanic Pedophilia network linked to the Vatican church is about to be come to an end. Remember back in 2014 when the Pope delivered a shocking message to the world stating that 2% of Catholic Priests are pedophiles? I'm am sure that number is much higher than claimed but at least that was a significant acknowledgement to the satanic powers that permeate throughout the Vatican network. AscensionWithEarth: Note that the JUDGEMENT card is tilted to the left and actually touches three other tarot cards. JUDGEMENT is touching the THE TOWER, THE WORLD, THE MAGICIAN. Is there a deeper meaning to this insignificant detail? The JUDGEMENT card along with the STAR card are the only two cards that are tilted. All other cards are perfectly centered. AscensionWithEarth: Notice the three buildings sitting on top of the globe/map? Do these represent the three city-states of the world which are known to be controlled by the New World Order/Illuminati. Washington D.C., London, Vatican? AscensionWithEarth: Some say THE MAGICIAN card represents the force that links the spirit worlds to the physical worlds via the magician who has the power to create what he/she desires. You can see that Virtual Reality and 3D printing are suggested as the top level theme for the coming industry boom associated with these new technologies. I also see another level being displayed, that of promoting and manifesting Artificial Intelligence and Transhumanism. VR, 3D Printing, and Transhumanism is the AI attempt to harvest and capture the organic nature of reality. The AI wants to become a creator so in essence will do everything possible to learn and become that of which it wants to mimic. People will become more focused on technology diverting the creational power "outside" of themselves for answers when they should be looking "inside" and discovering their divine nature of infinite potential. AscensionWithEarth: The JUDGEMENT card along with the STAR card are the only two cards that are tilted. All other cards are perfectly centered. You can notice a faint portrait of individual people inside the center of the star. The STAR card is also touching two cards, THE HERMIT and THE WHEEL OF FORTUNE. Just so you can get a better grip and understanding about the Rothschild mindset of the past, here are two of their most famous quotes. I am sure many will spend time trying to interpret these images and messages coming from the infamous Rothschild dynasty. Whether or not these messages from the Rothschild/New World Order/ show them admitting defeat or just another psy-op to keep the public masses confused and suppressed in 2017, we the people of this world need to wake up and reclaim our power. The power of the human soul holds no limits, so let us join together and tap this infinite source to manifest a reality that emanates love for all within this divine creation.